A suspected bike thief drowned in the sea today after he rode into a harbour to escape police. A passer-by told how the unnamed man shouted “I can’s swim” as he struggled to stay afloat in the water. The man died after he became trapped between an old fishing boat and the harbour wall. It was still dark when the man cycled into the sea while being pursued by police around 6.30am. Navy divers, police officers and the coastguard desperately tried to rescue the man from the water. 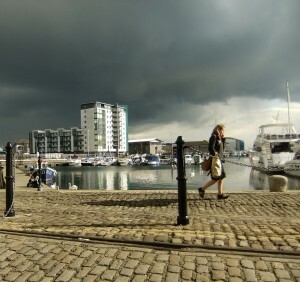 But they were unable to reach him and a body was later recovered from Sutton Harbour in Plymouth. A woman who lives locally saw the tragedy unfold when she went to feed swans in the harbour. She said: “I noticed the cop cars turn up shortly after I got here and then there were police all around the China House pub. “Then there were some police officers stood on the harbour and I offered my assistance. “I think he swam round and got himself trapped between the wreck and the wall. The woman said she heard a man call out “I can’t swim” before she was asked by police to move away.